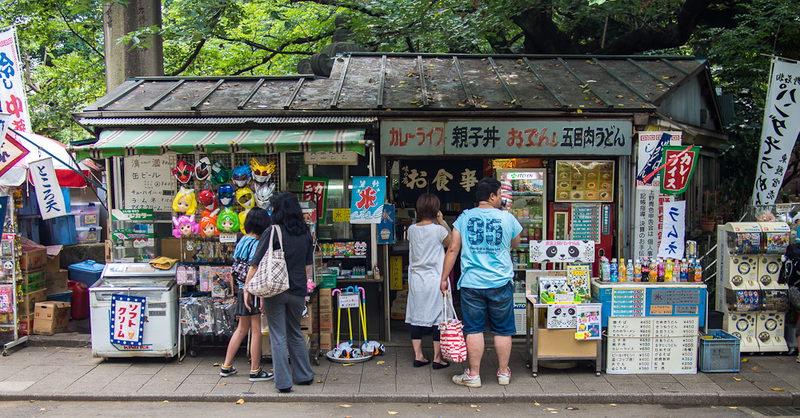 Our goal for the day was to head to stick close to home and explore neighboring Ueno, which is famed for its huge park that houses various museums, shrines, and even an aquarium! 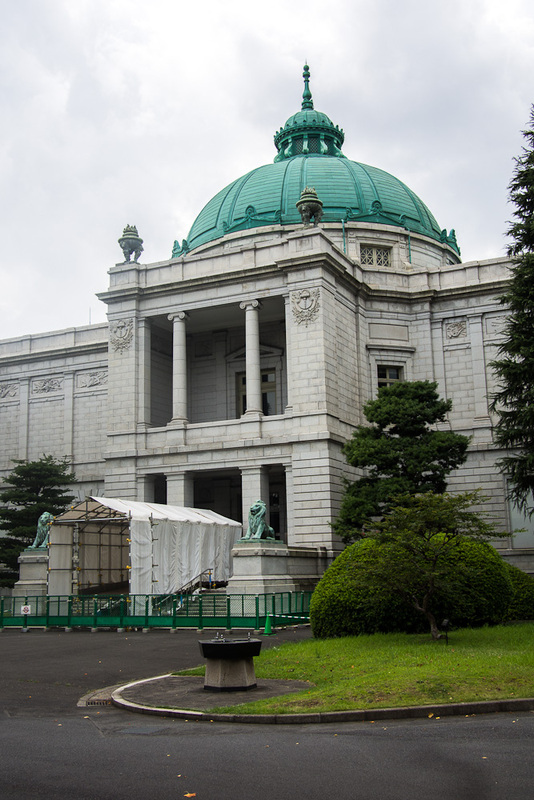 In particular, we were interested in checking out the Tokyo National Museum and Tosho-gu, a shrine that has a twin in Nikko, which we would be visiting in a few days time. On our way to the subway, we grabbed a delightful breakfast at a little hole-in-the-wall restaurant. 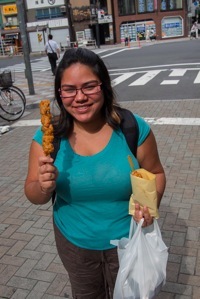 Prior to coming to Japan, we had heard about how it was taboo to eat food on the street, so we weren’t expecting to encounter so many food stalls. Granted, even after you buy your food, there tends to be nowhere to eat (apparently Japan is anti-bench) or throw away your trash (ditto on garbage cans… we have the distinct impression you are meant to carry around your garbage and throw it away when you get home), so do what we did and perch on some steps for your makeshift meal. 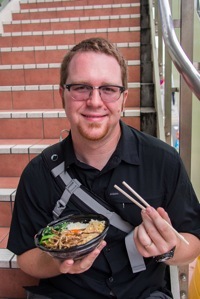 We wound up purchasing a pork rice bowl, some dumplings, and two mystery fried meat sticks (which turned out to be chicken and were the clear winners of our feast… Guess it’s true that fortune favors the brave!). And all for just 633Y, which just goes to show that if you are savvy about it, eating out in Tokyo doesn’t have to break the budget. Also: thank goodness we love savory breakfasts and have no qualms with eating what we would normally consume for dinner at the start of our day instead! We made it to Ueno just before 9:30 am and decided to wander around Ameyoko Shopping Arcade prior to the park, because we thought we would save the museum for later in the day when it would be much hotter. 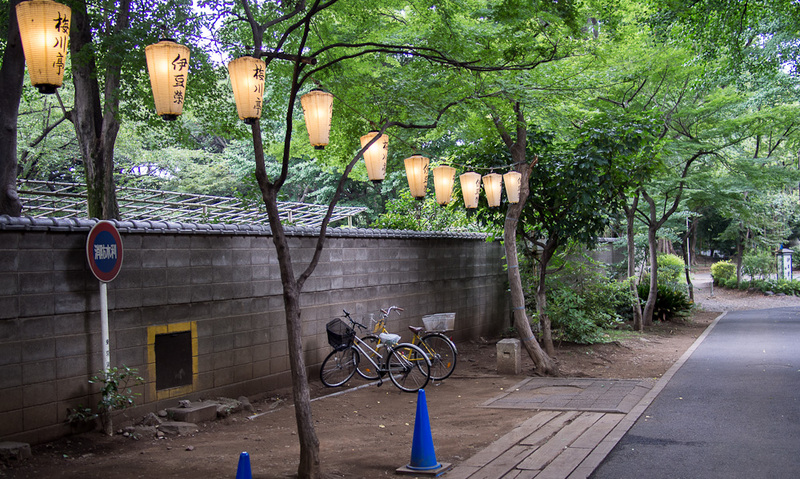 However, although it is not uncommon to see Tokyoites out and about in the early morning hours, it would appear the city itself is one that likes its beauty sleep. Many stores and restaurants close around 8 pm, but do not open again until 10 am. 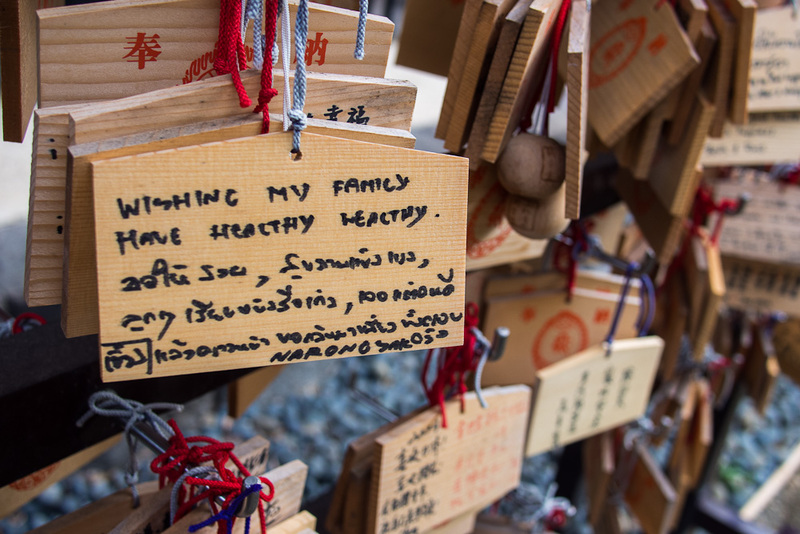 Given that most of the stores in Ameyoko were still closed, we decided to just head to the park and return later in the day when the scene would hopefully be a bit more animated. But not before we managed to find one shop where we were able to purchase Tony a much-needed sweat rag. Even though the Japanese never seem affected by the heat here, they all do carry around towels so that they can delicately dab away any unsightly persperation that might crop up due to the humidity. Just one day in, and it was clear that a sweat rage (with polka dots and pandas on it, no less!) was a necessary purchase! 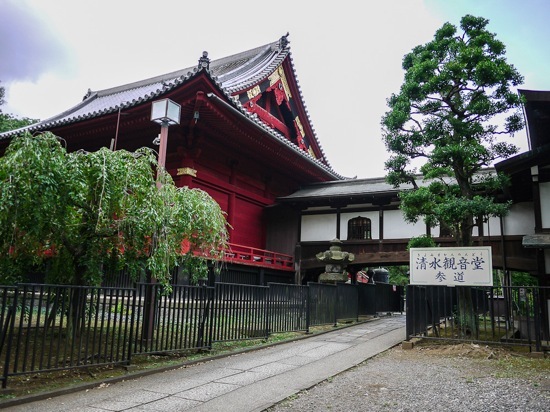 As we made our way through the paths of Ueno Park, we passed Kaneji temple where we had the unexpected treat of witnessing a monk-led prayer service that was in session. 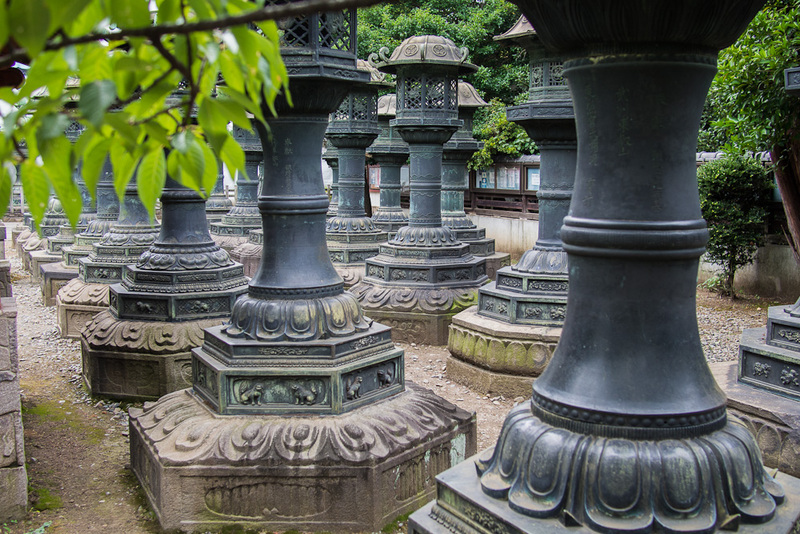 (Unfortunately, many of these temples and shrines do not allow photography inside.) 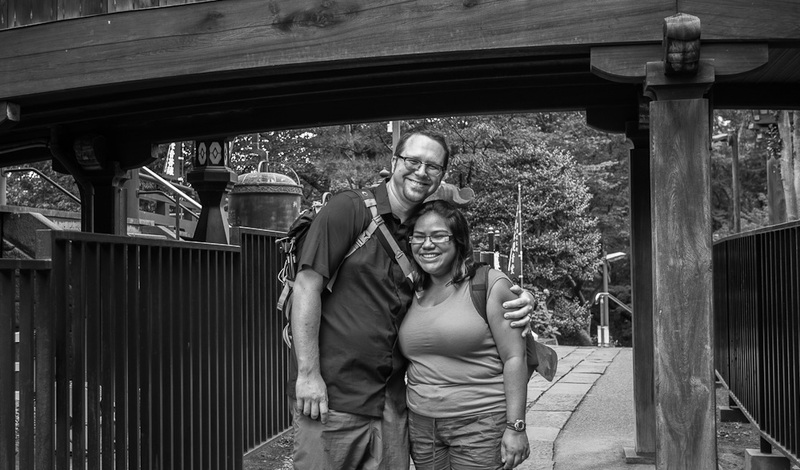 We only watched for a few minutes, but the experience definitely heightened our anticipation for the last few days of our time in Japan when we will visit Koyasan and stay at a functioning monastery and have the chance to participate in Buddhist service. Just outside Kaneji was a water station where we were able to observe a purification ritual most Japanese undergo before entering temples or paying their respects. Using the small ladles, they wash one hand, then the other, and then sip a small amount of the water before spitting it out. There was a schematic of the process next to the font, however given that we don’t read Japanese, we were unclear as to whether you are meant to drink or spit out the water. On Tony’s first try, he just drank the water down, but after observing several others who actually knew what they were doing perform this cleansing rite, we now know the protocol is definitely to spit! 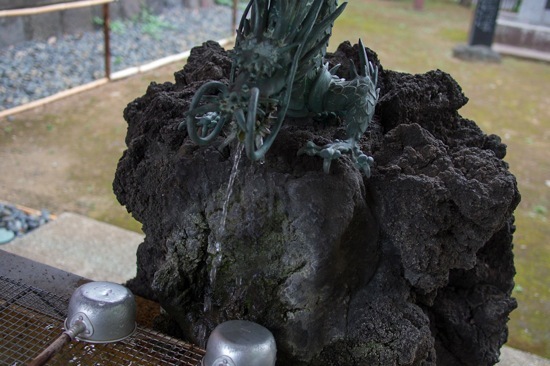 A cleansing water font outside of Kaneji Temple… Water from a dragon’s mouth is extra purifying. Detouring from our path to the museum, we made our way to Tosho-gu, only to find that it was getting a facelift and was closed. A large backdrop had been erected to shield Tosho-gu from view but which had its image emblazoned on it so that you could stand in front of it pretend you were there (and get your photo op, I suppose), but Tony & I were unimpressed. Somehow it just seemed to add insult to injury! It seemed the universe was indeed funneling us towards the museum, so we decided to quit dragging our feet and go there already. But not before Tony got stopped by a man dressed in monk’s robes (and he very well may have been a monk, I don’t know) who offered him a small golden sticker, which we thought was very kind. Of course, he then asked for a donation, and when I offered him 50Y, he shook his head and demanded 1000Y! He then pointed to his “donation book” and offered proof that others had given him 5000Y, but I was not buying what he was selling. I gave him back the sticker and apologized and walked away. 1000Y was just far too much money for us to give away in expensive Japan, and I kind of think it was a scam. I don’t even know if Japan has scam artists, but regardless, we will refer to this as the time that Tony almost got scammed by a maybe monk. Not only is this coin purse functional, it’s also fashionable. Double win! 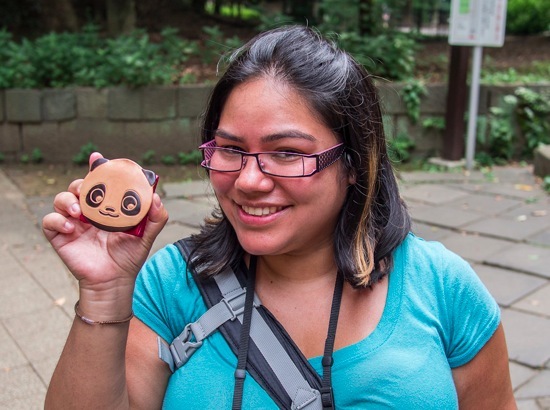 Deciding we REALLY needed to get to the museum fast, we tempted fate one last time by stopping at a little booth selling trinkets and doodads so that I could pick up a little panda coin purse. Not only was it adorable, but once again, necessary because the coin section of our travel wallet really wasn’t cutting it. No need why the things we buy can’t be practical and cute! Finally, with coin purse in hand, we were ready to see the museum! I missed this too!! Loved the captures and the coin purse is really cute!! While I was there, the weather was just fine, it was cloudy most of the time. The heat and humidity did not trouble us. Street food is the best!! Everywhere I’ve been, that’s been true. So…when I was in Paris, for one weekend during my six-week stay in France, the museum workers went on strike. The Louvre was closed, and most other museums, as well as the crypt and such at Notre Dame. To cap it off, the face of Notre Dame was covered in construction materials, getting a facelift, and we weren’t allowed to go inside. Sigh. Of course, all this meant that I ended up finding the Rodin museum instead, which instead of being closed, was just free and open to the public because the workers were on strike. That ended up being one of my favorite moments in France, so I guess it was worth the trade off. Eek about that scam! It does sound like one. I think it would be really frustrating to find a bunch of stuff closed if you had a limited stay somewhere and were really looking forward to doing those things, but we have already come to terms with the fact that traveling as long as we are, we are going to encounter a bunch of closed things along the way and that’s ok. We can’t see everything and if a place is awesome enough that we want to go back, we can always see the things we missed on a return trip! And as you point out, these “stumbling blocks” often seem to result in experiences that are even better than the ones we originally planned! 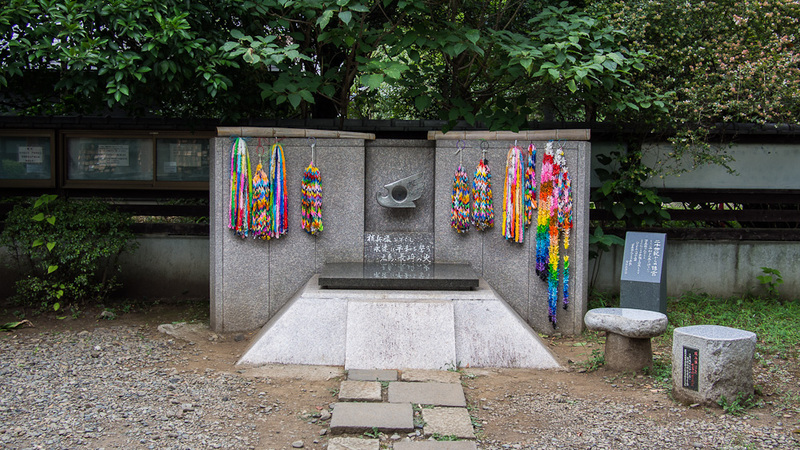 Any story behind the garden gnome greeting visitors to Ueno Park? He doesn’t strike me as local. Kinda made me think you were at an amusement park! 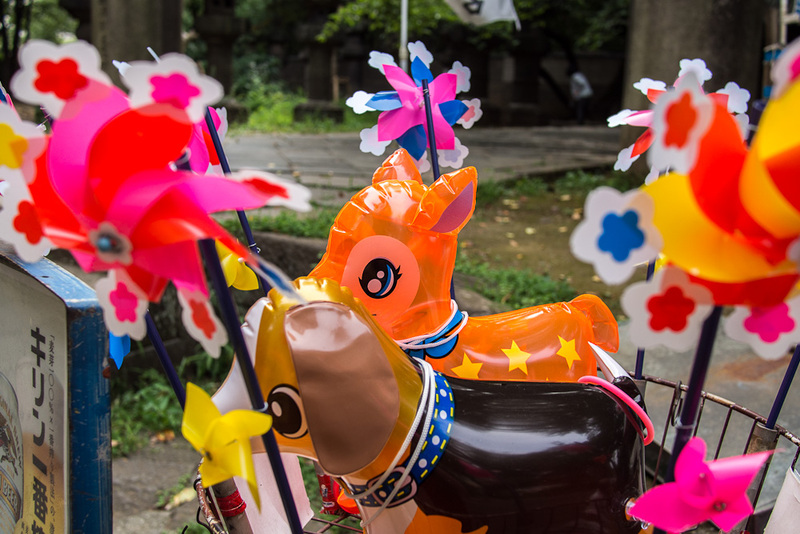 There is actually a mini amusement park in Ueno, so that is where that picture was taken. We liked how colorful and jaunty it was! Tony and Steph, Glad you guys are on your way!..looks like a grand time. …and Tony, the green sweat rag is “so” you. 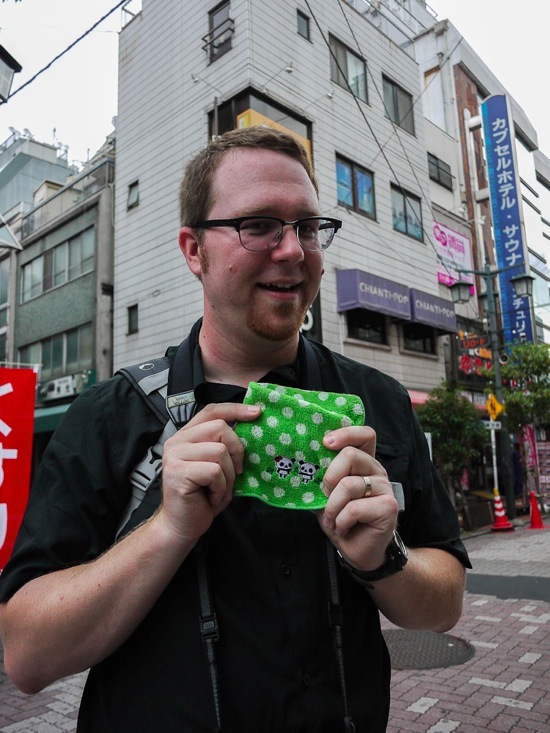 It’s safe to say that there is no fear of emasculation among the men of Japan, from purses to pink phones to stuffed animal charms, they have it all. I guess I figured I would embrace my masculinity and go for panda polka-dots. Good to hear from you!